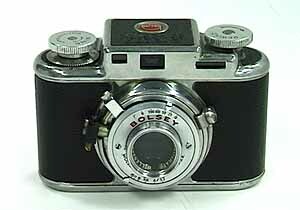 Around 1950's, when Bolsey 35 series came in the market, round-shaped cameras like this one were popular then. This series has rangefinder built in all the models. The viewfinder is right above the lens, and for that reason parallax is arisen only vertically. Another thing to mention is when using the color slide film. The film pressure plate in this model is not painted black, so paint it black to prevent the reflection before using the color slide film. Lastly, about the film wind knob. First raise the film wind knob to unlock, advance to the next frame with it and the film wind knob is locked again automatically by this procedure. Shutter speeds : T, B, 1/10-1/200sec. Body weight : appox. 410g.